Vitamin C: Antioxidant and Immune System Booster! 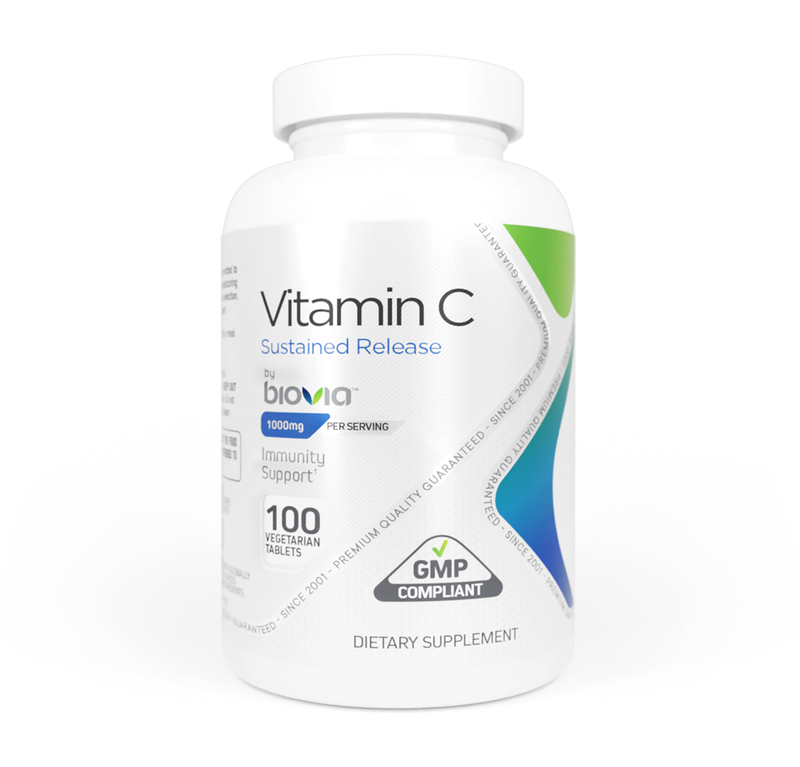 Vitamin C is a highly versatile and health enhancing nutrient active throughout the body. It is best known as a cell protector, immune booster and powerful antioxidant. This sustained release formula means you're getting a constant, effective stream of nutrients for maximum protection against free radicals and it is gentler on your stomach. Vitamin C is a water-soluble vitamin that is necessary for normal growth and development. There are numerous benefits that can be attributed to Vitamin C, including strengthening of bones and connective tissue, aiding in the healing of wounds, and increasing the performance of the immune system. Perhaps one of Vitamin C's best attributes is its amazing anti-oxidant ability. It protects the fluids of the body such as blood from damage by free radicals. By strengthening arterial walls, it also plays an important role in maintaining a healthy blood pressure, as well as reducing tissue damage. Vitamin C protects the cells of the body and may prevent damage caused to them by ageing and arthritis. Some studies printed in the Journal of Strength and Conditioning Research have shown that taking Vitamin C in doses of 1000 mg per day reduced the secretion of cortisol, allowing one's muscles to grow and lift better. There is a multitude of clinical studies that have been conducted substantiating Vitamin C's powerful effects. Some studies even show that Vitamin C reduces one's stress level. Why should you take Vitamin C? • Cholesterol: Acting as an antioxidant, one of vitamin C’s important functions is to protect LDL cholesterol from oxidative damage. (Only when LDL is damaged does cholesterol appear to lead to heart disease, and vitamin C may be one of the most important antioxidant protectors of LDL. )Vitamin C may also protect against heart disease by reducing the stiffness of arteries and the tendency of platelets to clump together. • Antioxidant: The antioxidant properties of vitamin C are thought to protect smokers, as well as people exposed to secondhand smoke, from the harmful effects of free radicals. A controlled trial demonstrated the ability of 3 grams of vitamin C, taken by nonsmokers two hours prior to being exposed to cigarette smoke, to reduce the free radical damage and LDL cholesterol oxidation associated with exposure to cigarette smoke. The smoke-induced decline in total antioxidant defense was also diminished. These beneficial effects were not observed in nonsmokers under normal conditions (no free radical exposure). • Allergies and Anti-Viral Properties: Vitamin C is needed to make collagen, the "glue" that strengthens many parts of the body, such as muscles and blood vessels. Vitamin C also plays important roles in wound healing and as a natural antihistamine. This vitamin also aids in the formation of liver bile and helps to fight viruses and to detoxify alcohol and other substances. • Heart Health: Recently, researchers have shown that vitamin C improves nitric oxide activity.4 Nitric oxide is needed for the dilation of blood vessels, potentially important in lowering blood pressure and preventing spasms of arteries in the heart that might otherwise lead to heart attacks. Vitamin C has reversed dysfunction of cells lining blood vessels. The normalization of the functioning of these cells may be linked to prevention of heart disease. • Eye Health: Evidence indicates that vitamin C levels in the eye decrease with age and that supplementing with vitamin C prevents this decrease, possibly leading to a lower risk of developing cataracts. Healthy people have been reported in some, but not all, studies to be more likely to take vitamin C and vitamin E supplements than are people with cataracts. • Diabetes: Vitamin C has been reported to reduce activity of the enzyme, aldose reductase, in people. Aldose reductase is the enzyme responsible for accumulation of sorbitol in eyes, nerves, and kidneys of people with diabetes. This accumulation is believed to be responsible for deterioration of these parts of the body associated with diabetes. Therefore, interference with the activity of aldose reductase theoretically helps protect people with diabetes. • Detoxification: Vitamin C may help protect the body against accumulation or retention of the toxic mineral, lead. In one preliminary study, people with higher blood levels of vitamin C had much lower risk of having excessive blood levels of lead. In a controlled trial, male smokers with moderate to high levels of lead received supplements of 1,000 mg per day of vitamin C, 200 mg per day of vitamin C, or a placebo. Only those people taking 1,000 mg per day of vitamin C experienced a drop in the blood lead levels, but the reduction in this group was dramatic. • If you are pregnant or lactating consult your health care practitioner prior to taking Vitamin C.
Other Ingredients: Stearic Acid, Ethylcellulose, Silica, Cellulose, Magnesium Stearate, Dicalcium Phosphate, Vegetable Coating.